Description: Fore! can almost be heard as this golfer drives his ball off the tee while the brilliant afternoon sun shines on the links as beautiful ambient light is evoked through a stunning Silver Mica shade. 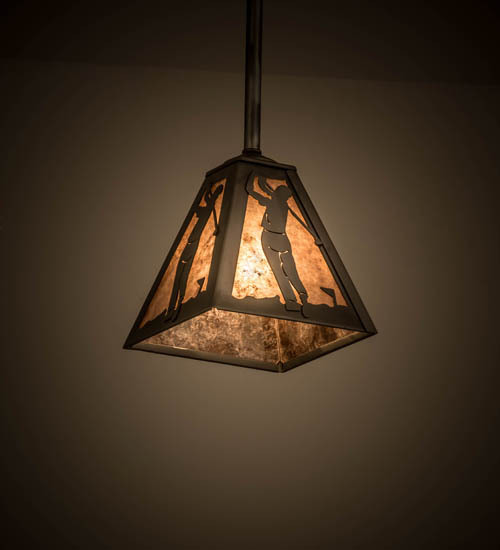 The golfer silhouette, frame and hardware of this charming pocket pendant are featured in a handsome Industrial Steel finish. Custom crafted in the USA, this fixture is ideal for a game room, man cave, golf course, clubhouse and other residential and commercial spaces. Custom colors, styles and sizes are offered, including dimmable energy efficient lamping such as LED. This fixture is UL and cUL listed for damp and dry locations.